Six brave contestants embark on a wild mission that will test their courage and skill as they compete in the action packed second series of ‘Big Five Challenge’. To win, they must track, locate and photograph Africa’s ‘Big Five’: the lion, buffalo, elephant, rhino and the elusive leopard, in the stunning Malilangwe conservancy at Singita Pamushana, Zimbabwe. Bonus points will be awarded in the daily photograph competition, as well as being given for spotting certain other animals and completing various tasks. This would be a difficult job even for an expert, but these participants have never been to the African Bush before. Though professional armed guides will accompany the contestants to keep them safe, they may not help them track the animals. 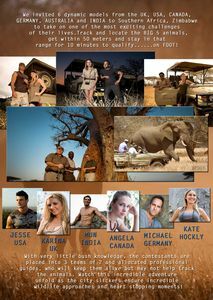 Will the competitors succeed or will they be beaten by the wild African Bush and its beasts?